Register Log In ECN Forum Forums NEC & other Code issues 314.23(B)(1) Box Supports. 314.23(B)(1)Nails and Screws. Nails and screws, where used as a fastening means, shall be attached by using brackets on the outside of the enclosure, or they shall pass through the interior within 6 mm (1/4 in.) of the back or ends of the enclosure. I have seen different reads on this in various forums. I am posting some examples of what IMO is code compliant. I am very interested in others opinions on this. I believe this to be code compliant. The nails pass through the interior within 6 mm (1/4 in.) of the back of the enclosure. The nails pass through the interior within 6 mm (1/4 in.) of the ends of the enclosure. I believe this also to be code compliant. 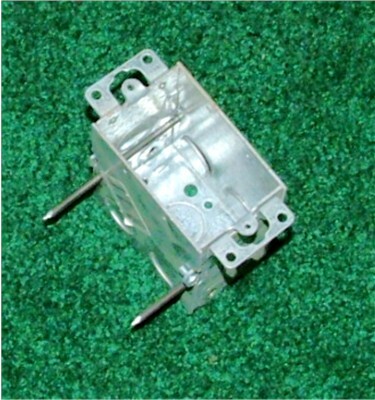 The screws do not pass through the interior at all, the screws pass through the exterior of the enclosure. That is my interpretation of this rule, so bring it on how do others see it. I do not use any of the above methods for mounting I am just curious. 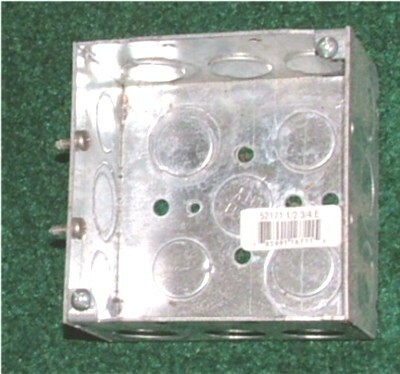 OK I have put screws in a 4" sq as shown in picture three. If pic's 1 -3 were Non-metalic boxes, I would see it as a violation. 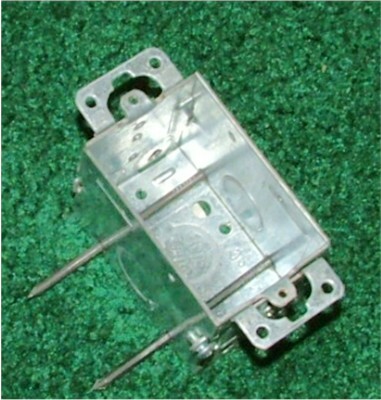 As the screws or nails could conduct outside the box without tripping the breaker for the circuit. I'm not sure that picture #3 reflects the intention of these holes. I read some place that those holes are not there for mounting the box. I would not write a violation for installing a box this way because I've done it that way myself. Maybe someone else has some information on the use of these holes. I seem to remember that those holes had been used for dipping the steel box in the galvanizing process originally. I find this discussion interesting in that it makes me wonder if a job I encountered some months back should have been rejected. In between the time the inspector approved the rough in of an addition the homeowner decided he wanted the receptacles lowered since now he was going to install tile 12 inches up the wall and the receptacles would have been partially out of the tile area. So, without notifying us he cut the nails holding the one gang plastic boxes to the studs and we came at finish to find the boxes dangling behind the drywall. Although we should have said "enough of this" and walked, we proceded to put drywall screws through the side of the boxes into the studs. The cables just barely made it into the boxes. Should this have been a violation and the customer made to open the walls? iwire, I hope I am not taking attention from your question because it seems related but this is important to me since we are scheduled to take this customer to court next month to collect funds we feel he owes us for tampering with our wiring. I myself have anchored boxes using methods id'd in 1, 2 and 3 and never rejected. I find this interesting. I do not understand why you feel this way, I am not saying you are wrong I just need some more info. The screws in the side of the box do not in any way pass through the interior of the enclosure. All the definitions came from the Merriam-Webster On line Dictionary. So that is why I have a hard time with this article, we would have to change some of the definitions in order to enforce the section the way you want to. That said I will keep an open mind, maybe I am missing something. The 2002 handbook is no help at all for this, I would call the handbook commentary after this section gibberish. 2002 NEC Handbook 314.23(B)(1) Commentary. This requirement prevents the nails from interfering with the installation of devices. Permitting nails inside the box within 1/4 in. of the ends reduces splitting of the smaller wooden studs used in some frame-type construction. However, splitting sometimes occurs where nails are within 1/4 in. of the back of the box. By the way some may feel I am pulling apart the code and trying to find ways around the NEC. That is not the case at all, the CMPs choose certain words for a reason, in this case they chose words that IMO suggest the section only applies to nails and screws that literally pass through the inside of the enclosure. Okay, let's for the sake of this discussion, say that photo #3 represents an incorrect installation for what ever reason. Does anyone know what the intended use is for these holes? Come on Tedesco, you should know. You are correct in saying that CMP members do use specific language. But remember that some of the requirements go back to the past before some of the methods today have been encountered or thought of. I was at the Eastern section meeting this past month and there were several CMP members present. It is informative not only to hear the code issues, but to talk to them and hear how hard the process can actually be. This very subject of how the support of boxes was brought up, and they used some slides and open conversation to discuss this. Boxes, especially plastic boxes are not designed or "tested" (the key here is 'tested') to be supported by the wall of the box from the inside of the box. Because of the non tested part and the fact that manufacturers will not say it is to be installed in that fashion, it is a violation. They also brought up another interesting aspect of the nails or screws installed through the box within 1/4 inch from the back - that if a screw is used, the threads pose a hazard to the conductor insulation, and require a sleeve over the shank of the screw threads that pass through the box. So much for using screws through the box. Pierre this is really getting to be a mess. I agree that plastic boxes are weekend by using screws through the side, but are the holes for mounting required to be tested for the purpose? I run a lot of metal wireway, the fact that it is made to be customized leads me to drill my own holes for mounting the wireway and when you shorten one up you need to make your own holes for the fitting you will be putting on. Are you telling me all this is a violation. I agree this is could be an issue but what do you mean by "So much for using screws through the box." 314.23(B)(1) says we, can no room for discussion. Ryan mentioned that the 2005 314.23(B)(1) has been changed, does the new wording say screws? Lets stay on target why did they use the words "pass through the interior" if that is not what they meant? And if that is not what they meant that is a problem because that is what it says. Intent is not enforceable the written words are what is enforceable. By the way if I sound upset or mad I am not. I am still just trying to get some answers.